Saugata Basu has a joint appointment as a Professor of Mathematics and Computer Science with Mathematics as his home department. He comes to Purdue from the Georgia Institute of Technology. His research interests are in real algebraic geometry, computational algebra and geometry, and theoretical computer science. Basu has previously held positions at the University of Michigan, IBM T. J. Watson Research Center, and the Mathematical Sciences Research Institute in Berkeley. He received his PhD from the Courant Institute, New York University and his BTech degree from the Indian Institute of Technology, Kharagpur. Basu has also held visiting positions at Universite de Rennes, the Institute of Mathematics and its Applications in Minneapolis, and the Institue Henri Poincaré, Paris. Saugata Basu, Thierry Zell, "Polynomial hierarchy, Betti Numbers and a real analogue of Toda's Theorem", Foundations of Computational Mathematics, 10:429:454, 2010, (preliminary version appeared in Proceedings of the Symposium on Foundations of Computer Science (FOCS), 2009). Saugata Basu, "Combinatorial Complexity in O-minimal Geometry", Proceedings of the London Mathematical Society (3) 100 (2010) 405-428, (preliminary version appeared in the Proceedings of ACM Symposium on Theory of Computing (STOC), 2007). 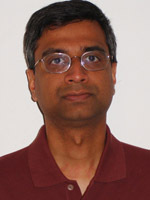 Saugata Basu, "Computing the Top Betti Numbers of Semi-algebraic Sets Defined by Quadratic Inequalities in Polynomial Time", Foundations of Computational Mathematics,8:45-80 (2008), (preliminary version appeared in the Proceedings of Symposium on Theory of Computing (STOC), 2005).